Liberator: In your view, why is poetry so important? Giovanni: Poetry is the most informative of all of the arts because everything comes down to poetry. No matter what it is we are describing, ultimately we use either a metaphor; or we say “that’s poetry in motion.” You drink a glass of wine and say, “that’s poetry in a bottle.” Everything is poetry, so I think we come down to emotional information. And that’s what poetry conveys. Liberator: Is there a group of people you think benefit most from poetry; in other words, do you have an ideal audience? Giovanni: Poetry is like air. Is there a group that benefits more from air? I don’t think so. It’s one of the necessary things. Everyone benefits from poetry. And as you know, poetry is international. There are only two things that are truly international, poetry and wine. It’s true. 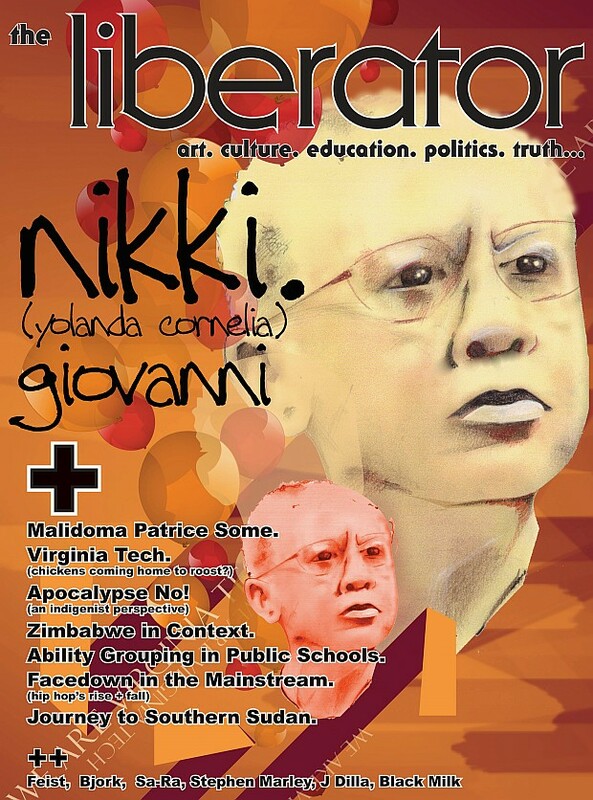 Liberator: Where does truth-telling in poetry come from? Liberator: If truth is in poetry, can poets help remedy the plague of lies that we see permeating popular American culture and infiltrating Hip Hop? Giovanni: Well, if you bring in light, the roaches scatter. That we do know. Poetry brings that light, and that’s why in many countries people like me would have been in jail a long time ago. The war is a lie and poets are going to call our leaders out on that. But I don’t think Hip-Hop is a lie or that poetry is an antidote to lies. I think the antidote to George Bush is a new president. What poetry does is it helps people to be a bit stronger. Rosa Parks didn’t recite the poem on the bus; that was a political act. And yet we know that at some point one of the things that comforted her -- being an A.M.E -- was her bible, which is poetry. So, there is a personal and a political side of poetry for people. Liberator: How is poetry different today than what came out of the Black Arts Movement? Are people still using creativity to battle what we are confronted with in our society? Giovanni: We [Black people] have always used our creativity to battle and we’re not the only ones. Black Americans are certainly leaders in that simply because we were denied education and dealt with enforced illiteracy. But people seem to always forget that literacy is not the only way of learning things or conveying knowledge. If we think holocaustically, I think Black Americans should be given credit for finding probably the perfect weapon; the weapon of the song. And that song continues. Most holocausts don’t, so they have this bitterness left over. The phenomenon of the world, as far as Black Americans are considered, is that we are not a bitter people. I think there’s a lesson to be learned in that. I’m very proud of the Hip-Hop generation. One of the main things that they do that we didn’t do is make money ... they’re all millionaires, not each and every, but quite a few of them are. There were none in my group. If you look at Jay-Z and Nas they are both making seven and eight figures, and I think this is good. You have to use what you have in order to get what you need and the people can not be rich unless somebody is rich. The Hip-Hop generation has carried more people with it than any other enterprise Black Americans have had. Hip-Hop has taken a group and everyone who has been involved with that group has been lifted up. You have to give them credit for being good businessmen. Liberator: What about the continuing debate over whether or not Black women are getting the raw end of the deal in Hip-Hop with respect to the way we are being portrayed? Giovanni: Well, I get tired of it, I’ll tell you that. I’m amazed that we have had conferences on the N-word and we’ve had conferences on how Hip-Hop looks at women, and we’ve had conferences on how Hip-Hop does something else, but we haven’t had conferences on the war, we have not had conferences on healthcare or the proliferation of prisons. So it says to me that either someone doesn’t know what they’re doing, or somebody does. And I think that someone does, and they are pushing us off the real issues. You’re a young woman, you know it’s so simple, if you think it’s misogynistic then you shouldn’t dance to it, don’t buy it. That’s not to say you don’t want to correct things because obviously one wants things to be better. It worries me way more that every time you turn around there is a new prison being built because it means someone has to go into it. That worries me more than where someone is swiping a credit card. Liberator: Are you saying we have bigger battles to fight? Giovanni: No, I’m saying we have battles to fight. These are art questions. Liberator: What advice do you have for young female writers trying to find a voice with words and dealing with the vulnerability of allowing others to interpret those words? Giovanni: Well, first of all they are your words and you shouldn’t allow anyone to interpret them. If you are sitting there waiting for someone to tell you how wonderful you are, you’ll never get anything done. Women need to get over being women. I’m tired of that socialization of women; that we are always supposed to be sitting around pleasing somebody. You can’t ask people about your art... it’s yours.